A couple of nights ago I had some difficulty sleeping. I was tossing and turning thinking of all the things I had to get done in a short amount of time. I was anxious and I knew it. The next morning I read Philippians 4:6, "Do not be anxious about anything, but in every situation, by prayer and petition, with thanksgiving, present your requests to God." Do you know what the cure for anxiety is? Two verses before we have our answer! 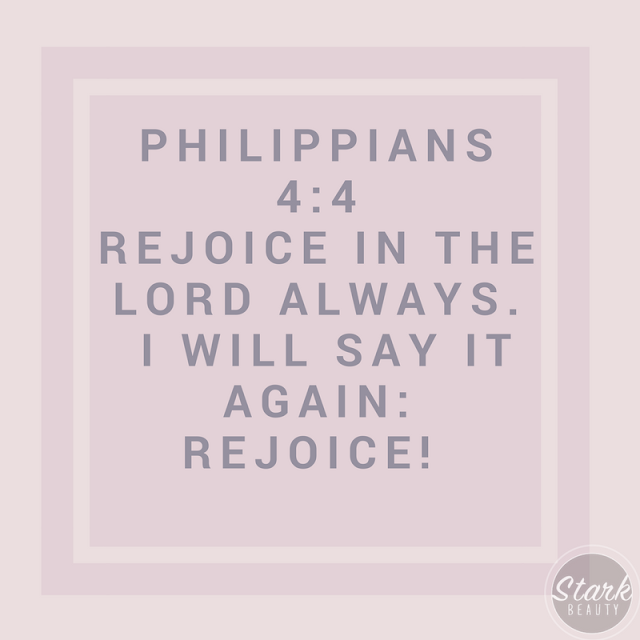 Rejoice always! I was reminded of Paul and Silas- they were in prison (an inner cell with their feet in stocks). From an outward standpoint, they had NO reason to rejoice, but they still were praying and singing praises to God! So loud that the other prisoners could hear! Do you know what happened next!? Their chains were broken and they were set free! Maybe you can't think of many reasons to be thankful right now, thank Him anyway! He is so worthy and we are so blessed! Once you're done praising Him it's hard to even ask Him for anything because you'll have such a peace in knowing it's already taken care of! We serve such an awesome Father.